K.K. is trading his guitar for dice. Among the surprise game announcements from Nintendo’s Digital Event yesterday was Animal Crossing: amiibo Festival for Wii U. Now, it doesn’t seem to be the game Animal Crossing fans wanted, but it does have some appeal to younger fans and families looking to play something together. 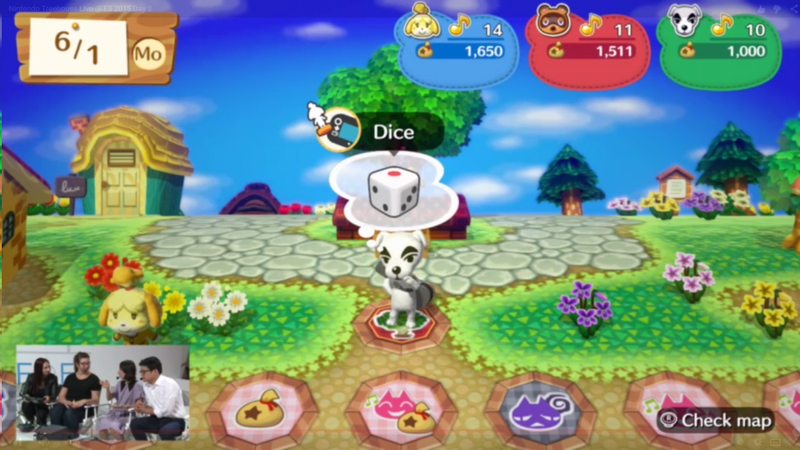 During a Nintendo Treehouse Live demonstration, we got to hear from Animal Crossing: New Leaf director Aya Kyogoku explain some of the design choices and features from the game. We got to see some of the gameplay, and it’s pretty simple and a bit similar to the amiibo Party mode from Mario Party 10. Tom Nook spends his money wisely. You play with the Animal Crossing amiibo figures, which, according to an Amazon listing, the game includes two amiibo and 3 NFC cards. The amiibo are used to throw your dice and move around the village. When you land on a spot, some event occurs, and you either get Happy points, lose some points or get Bells, the game’s currency. The events are things you would normally do in an Animal Crossing game, like go shopping, build a house, go fishing or encounter special characters. In the above screenshot, a special villager appeared, and when you land on her space, you play a simple minigame where you must decide if Katie will pull a higher or lower card than the one she has in her hand. Guess right and win a card that allows you to move that many spaces. It seems very easy, and that’s by design. The director of the game talked about playing with little kids, including those that have limited reading comprehension. It’s all very luck based, but you can have fun playing with your family. Some spaces have bonuses assigned to them. You can also customize some aspects of your village. Any home designed in Animal Crossing: Happy Home Designer can be brought over to amiibo Festival. The NFC cards are also compatible with this game, so you can bring over your favorite villagers that you’ve collected. The game also changes depending on the month in which you play. In the demo, they were playing in June, so the weather was nice. If you play the December board, there will be snow and different events. Of course, Redd is back and his prices are CRAZY. Finally, there was mention of other game modes that they couldn’t talk about at the moment. But certainly the indication is that there is much more to this game than what was shown. People will of course want a full Animal Crossing experience, but it’s available via New Leaf on 3DS, which in my opinion is better suited for the traditional Animal Crossing play style. What do you think? Is this a game you can see yourself playing? Are you curious to find out what more there is to amiibo Festival? Let us know in the comments section. Next Post:Mario Tennis: Ultra Smash Information, Screenshots and Trailer.